Many people have stained teeth and turn to cosmetic dentists for help. Here’s an index of some of the information on this web site about stained teeth. Click here to go to our main teeth stains page. One of the best tools you can use to prevent and treat stained teeth is Supersmile toothpaste. It breaks down the protein pellicle that coats the teeth, which is the most effective way to keep the teeth their whitest. Tetracycline stains are the most stubborn. When children take tetracycline while their permanent teeth are forming, a brown or gray stain is incorporated into the very dentin of the teeth, often in patterns of horizontal stripes. Persistent bleaching can tone down these colors, but only covering the teeth with porcelain veneers can make them look bright white again. Fluorosis stains can’t be bleached away. They need to be covered with tooth bonding or porcelain veneers. The presence of stains on porcelain veneers, if they are on the edges, could indicate decay starting to leak in around the veneers. Check with an expert cosmetic dentist if you have this problem. 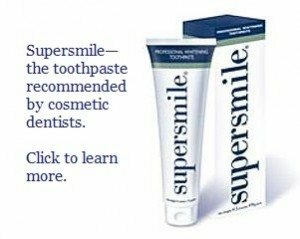 Supersmile toothpaste is also very effective at removing tobacco stains on teeth. Peridex is an oral rinse that is prescribed during some gum disease treatments. Peridex stains are brown and ugly. Again, regular use of Supersmile while you are using Peridex will prevent these stains from forming. Discolored teeth is a slightly different concept from stained teeth. Read about that by clicking this link. This information is provided for you by the mynewsmile.com cosmetic dentist referral service, and was personally written by Dr. David Hall. For referral to an expert cosmetic dentist to treat your stained teeth, please see our find a cosmetic dentist page.